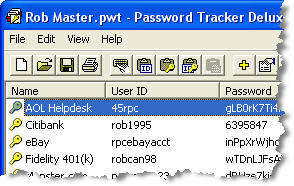 Password Tracker Deluxe stores passwords and usernames neatly and securely (encrypted) on your computer so you don't have to remember them! When needed, your passwords are easily accessible in the Windows desktop system tray. If you want, Password Tracker Deluxe will automatically insert your usernames, passwords, or any other text information for you when it's needed. It can remind you to change your passwords, and even assist you in creating newer, random and more secure passwords. You can even use Password Tracker Deluxe to quickly launch your favorite programs! Password Tracker Deluxe has won some of the most coveted and prestigious shareware awards on the internet! From the ZDNet "Editor's Choice 5-Star" award, to the Microsoft and Windows User's Group "Internet Best Choice Shareware Pick of the Week" award, Password Tracker Deluxe continues to be one of the most sought after password management software utilities available. Copyright ï¿½ 1998-2010 Carl L. Roth. All rights reserved.